The Hashtag Glove uses voice-recognition and conductive fabric to help you tweet hands-free. How many times have you been like, "GAH, TWEeTInG is sO hARd." Especially when it's cold out and you're just trying to stay warm. How are you supposed to brag to your friends about all the cool stuff you're getting into? Well, thankfully these cool dawgs invented the Hashtag Glove, a voice dictated tweeting glove that posts to Twitter whenever the wearer makes a hashtag symbol with his fingers. That's Andrew Deaver, Patrick Huston, Byron Wasti, and Keenan Zucker from Olin College, by the way. The four came up with the idea for the Hashtag Glove after watching that Justin Timberlake hashtag sketch on Late Night with Jimmy Fallon. 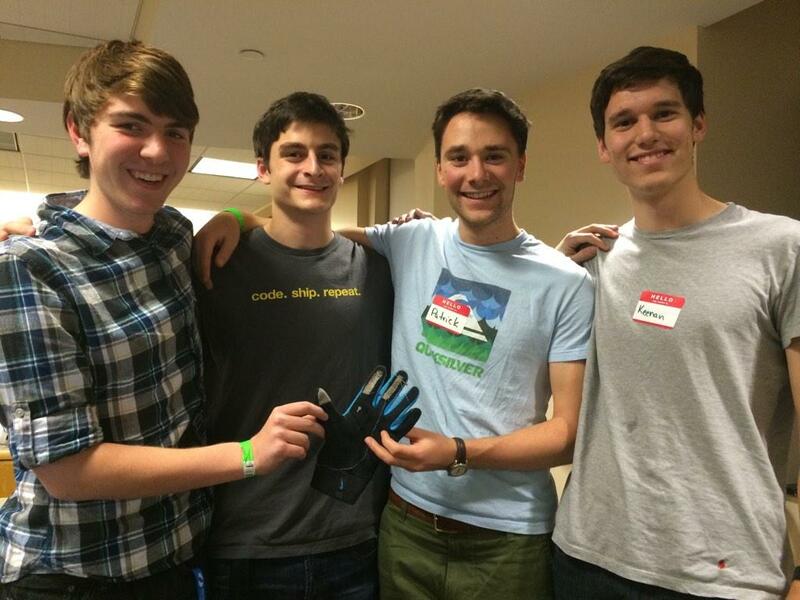 The crew put the glove in action during a 24-hour hackathon at Mt. Holyoke College in early November. How it works: “There’s conductive fabric on the tips of the fingers, and we put a voltage across them,” Byron Wasti told the Daily Dot. “And then you just short it, and it detects when you short the signal. It’s really basic." The gloves are still in the prototype phase, but the team hopes that they'll eventually retail for around $50 a pair. Here's a video of the gloves in action. The team thinks they'll be good for snowboarders, skiers, or just anyone who lives in cold weather. And #lazy people, too.